By this point in the year, many of us are ready for cozier clothes and pumpkin-spiced everything…but for a lot of this month, it’s still sweltering! The good news? That hot weather keeps many of your favorite summer vegetables going strong, giving you a few weeks to transition from high summer to full-on fall. Start the month out by making the most of the local tomatoes, corn, berries and even peaches that are still here. Then get ready for fall by visiting one of the many local farms that open their doors to the public for fall festivals closer to the end of the month. Sunflowers are also in full bloom this month. Besides being a beautiful backdrop for photographs, these cheerful blooms are also good for the environment. 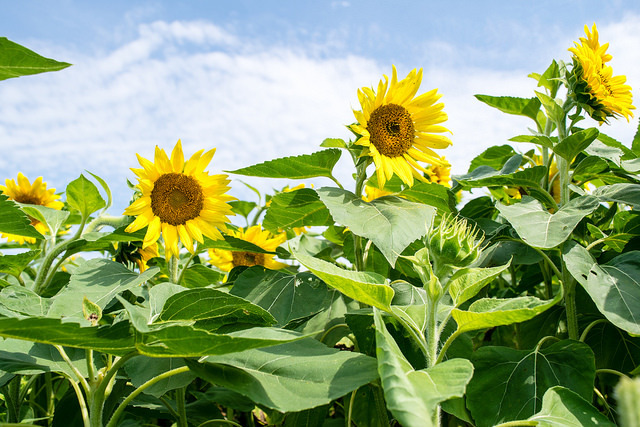 Sunflowers are often used by farmers who follow sustainable practices as a cover crop, because they clean and condition the soil as they grow, while preventing erosion. This is ultimately good for the health of our area environment and the Chesapeake Bay watershed. So keep that in mind as you pass fields of the yellow blooms on area roads this month! Apples, collard greens, kale, spinach, chard and other greens, late-season raspberries and blackberries, corn, tomatoes, peaches, broccoli, radishes, onions, peppers, green beans, herbs, summer squash and hard winter squashes such as acorn and butternut, sweet potatoes and white potatoes, grapes, pumpkins.